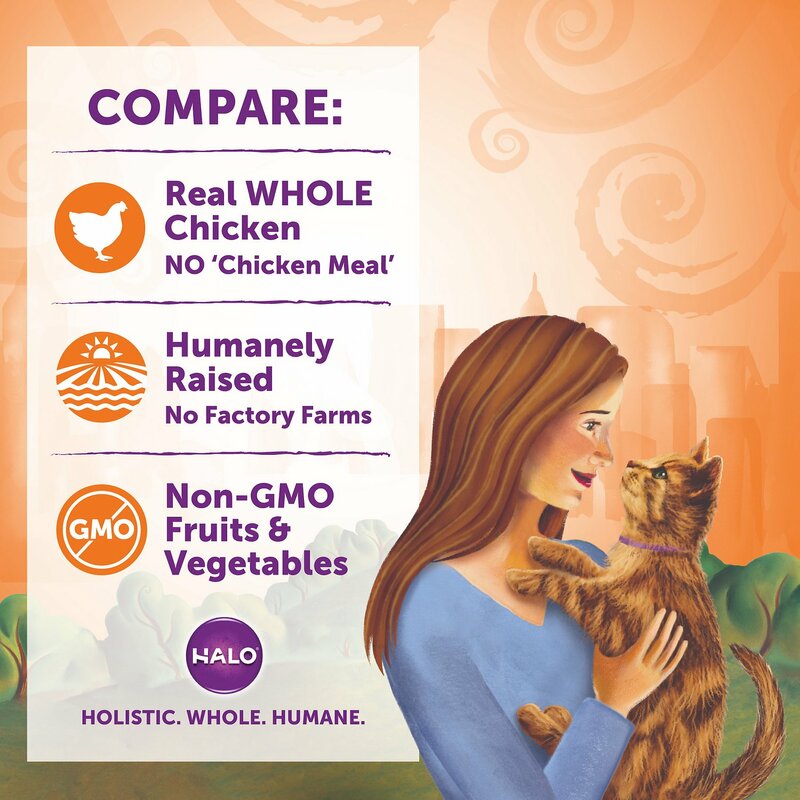 Feeding your feline friend a holistic diet makes a whole lot of difference when it’s Halo Holistic Chicken and Chicken Liver Recipe Grain-Free Healthy Weight Indoor Cat Dry Cat Food. It’s made with sustainably-raised, cage-free chicken as the very first ingredient, along with a wholesome variety of non-GMO garden vegetables and nourishing oils. This special recipe is formulated with lower protein, and the correct caloric and fiber content, to help your furry friend maintain her ideal weight. There’s never any kind of meat-meals, so she’ll love the meaty flavor and it’s highly digestible to ensure she receives the maximum nutritional benefit with less waste. Vitamins, minerals and trace nutrients, including taurine for her eyes and heart, are added to help keep your happy cat healthy–inside and out. Made with real, whole chicken and never any rendered meat meal, like chicken meal or fish meal. Special recipe is formulated with the ideal caloric and fiber content for healthy weight maintenance as well as L-carnitine to boost metabolism. Proprietary DreamCoat supplement provides essential fatty acids and nutrients for healthy skin and a lustrous coat. Old Formulation: Chicken, Eggs, Pea Protein, Vegetable Broth, Chicken Fat (Preserved With Mixed Tocopherols And Citric Acid), Whole Peas, Chicken Liver, Flax Seed, Salmon Oil (Preserved With Mixed Tocopherols), Pea Fiber, Sweet Potatoes, Apples, Green Beans, Carrots, Blueberries, Alfalfa, Cranberries, Zucchini, Calcium Sulfate, Dl- Methionine, Potassium Chloride, Taurine, Inulin, Salt, Vitamins (Folic Acid, Vitamin A Supplement, Vitamin D3 Supplement, Vitamin E Supplement, Vitamin B12 Supplement, Choline Bitartrate, Niacin, D-Calcium Pantothenate, Ascorbic Acid, Riboflavin Supplement, Thiamine Mononitrate, Pyridoxine Hydrochloride, Biotin), Minerals (Zinc Proteinate, Iron Proteinate, Cobalt Proteinate, Copper Proteinate, Manganese Proteinate, Magnesium Proteniate, Calcium Iodate, Sodium Selenite), Dried Lactobacillus Acidophilus Fermentation Product, Dried Bifidobacterium Longum Fermentation Product, Dried Enterococcus Faecium Fermentation Product, Dried Lactobacillus Plantarum Fermentation Product. New Formulation: Chicken, Chicken Liver, Dried Egg Product, Dried Peas, Dried Chickpeas, Soy Protein Concentrate, Dried Potatoes, Natural ﬂavor, ﬂaxseed, Pea ﬁber, Potato Protein, Chicken Fat (Preserved With Mixed Tocopherols), Salmon Oil, Calcium Sulfate, Dicalcium Phosphate, Dried Bacillus Coagulans Fermentation Product, Dried Blueberries, Dried Cranberries, Dried Carrots, Dried Sweet Potatoes, Salt, Inulin, Vitamins (Vitamin E Supplement, Niacin Supplement, Thiamine Mononitrate, D-Calcium Pantothenate, Vitamin A Supplement, Pyridoxine Hydrochloride, Riboﬂavin Supplement, Vitamin D3 Supplement, Vitamin B12 Supplement, Folic Acid, Biotin), Potassium Chloride, Minerals (Zinc Proteinate, Iron Proteinate, Copper Proteinate, Manganese Proteinate, Sodium Selenite, Calcium Iodate), Taurine, Mixed Tocopherols (Preservative), L-Ascorbyl-2-Polyphosphate, L-Carnitine. 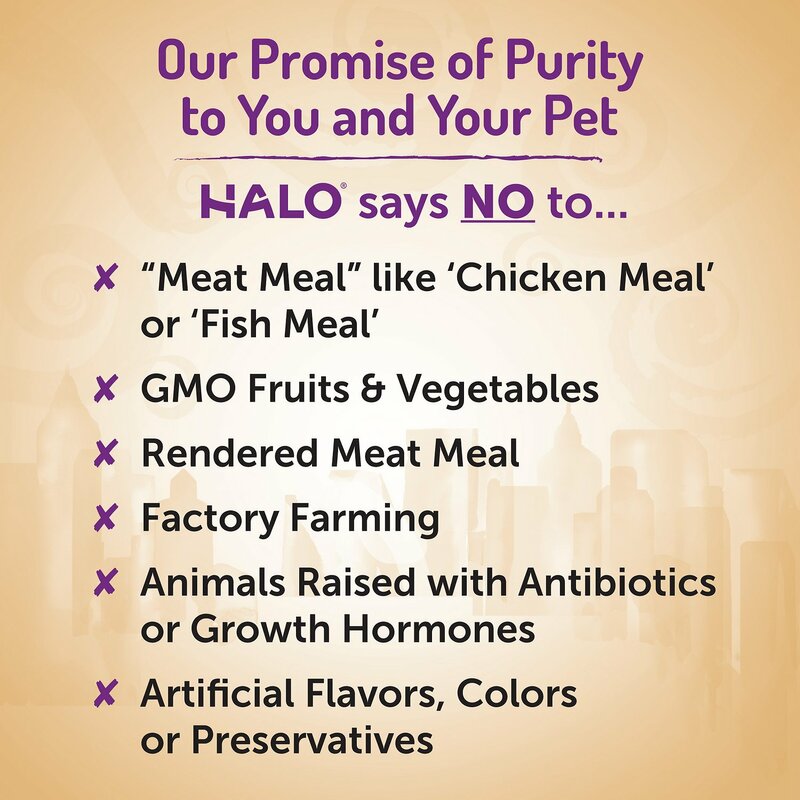 When pet parents want to give their pets a holistic food that's made with pure, natural, whole ingredients, they choose Halo. Their recipes use responsibly sourced whole meats and non-GMO vegetables, and never any meat meals, animal by-products or added growth hormones. It's exactly what nature intended—highly digestible ingredients that are slow-cooked in small batches to create cat food with less ash, more bioavailable nutrients and delicious flavor. Halo believes that whole meat equals a whole lot more digestibility. As obligate carnivores, cats need meat, not just parts of animals that you wouldn't consider to be meat. When your pet gets whole proteins instead of rendered meats like chicken meal or fish meal, they're getting optimum nutrition that's easier for their body to digest. And that means they can get the full benefits of each nutrient-rich ingredient. What's in Your Cat's Bowl? Holistic Whole Meat: Salmon, whitefish, chicken or turkey that's slow-cooked provides a more digestible source of protein with up to 16 times less ash than rendered meat. Because each recipe is made with whole meat, it's easier for your cat to digest. With Halo, more of the nutrients stay in and go to use inside your cat's body, so less is likely to come out as waste. 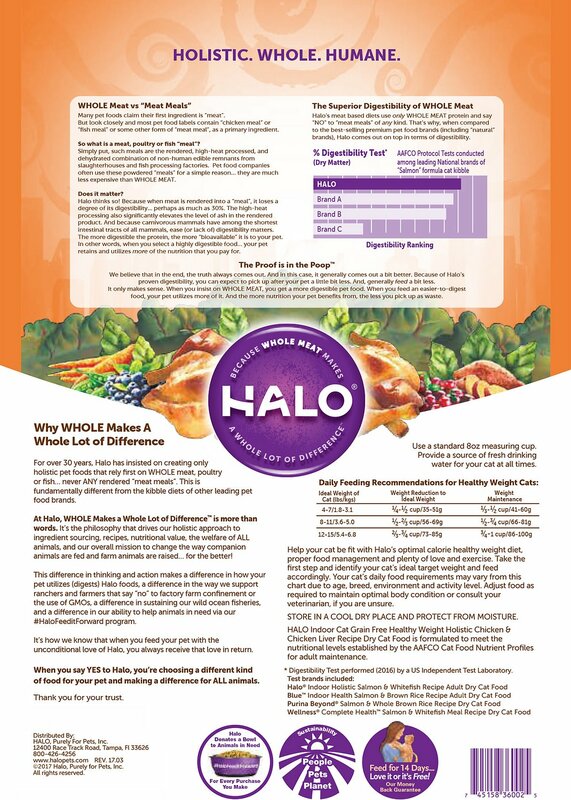 In a digestibility test performed by an independent US laboratory, Halo's kibble came out at the top of the rankings. The difference Halo makes isn't just on the inside—it shows through in the coat, too. Their exclusive DreamCoat blend is added to dry food formulas to help keep your cat's skin smooth and coat shiny. This combination of botanicals and other ingredients provides balanced essential fatty acids for ongoing skin and coat support. My finicky cat loves it! I have unopened containers of expensive cat food,he won't touch. He was a rescue as a baby with severe stomach issues the vet never resolved. I kept searching for a food that would help and finally found chicken & rice. He is now better, but is very particular, but he loves this food! Cries for more when his bowl is empty! 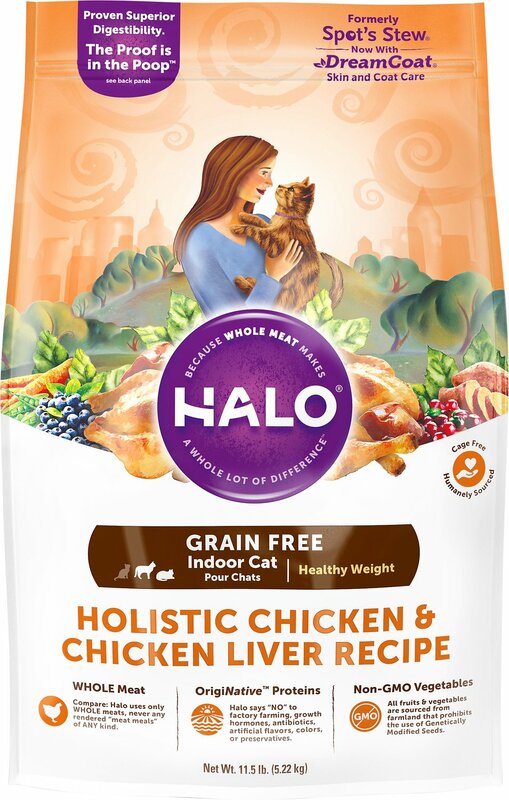 My four cats like halo chicken and chicken liver dry cat food. Game bird medley is being discontinued, I was happy my kitties like this dry food, along with salmon and whitefish halo dry food. Small pieces, which are easy to chew and digest. Very satisfied with this brand of dry cat food! I have one cat that only eats dry food and she really seems to love this brand. Halo has a good reputation and has never had any recalls that I'm aware of. I have three cats of which two have digestive problems. My older cat vomited several times a day. She is 15 years old. Since she has gotten on Halo cat food she has quit vomiting. What a miracle!! I didn’t expect that. The other one has problems with constipation. That too has cleared up. I am really impressed with Halo cat food. Thank you for the excellent product. 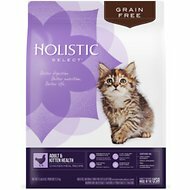 I mix this with Holistic Select Healthy Weight for my 14 year old Torbie. She was lukewarm to the Holistic Select, so I chose the Halo based on the ratings. She eats much better now. All 6 of my cat loved the turkey Halo but that's not available so I tried the chicken. They do not feel the same about the chicken. Gonna give one more of the Halo brand foods a try in hopes that they will want to eat it.